Why attending Enterprising Women in Tech event? You see all these events and you wonder why to attend our event? Let me give you some very good reasons! 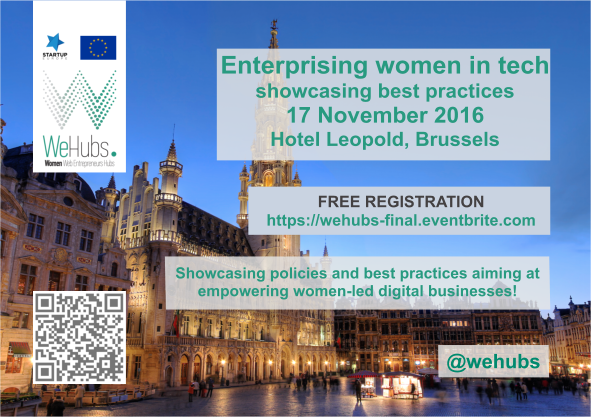 In Celebration of Women’s Entrepreneurship Day 2016, WeHubs is promoting “Enterprising Women in Tech” event in Brussels, next Thursday 17th November. Learn from Members of the European Parliament about trends on the EU political agenda at EU level. Learn about funding opportunities for the promotion of more women to become entrepreneurs in the ICT sector. Get inspired from WeHubs Success Stories and the most promising ideas selected from the WeHubs Ideas Competition. Learn how to provide more tailored services to women entrepreneurs from top players. Do you need more reasons to attend the event and join our community? Stay tuned to learn more about our speakers! Follow @WeHubs and #WomenInTech and don’t hesitate to spread the news!